Future Village's aim is to construct over 130 earthquake resistant homes with our organizational partners and by fully involving local community at every step. 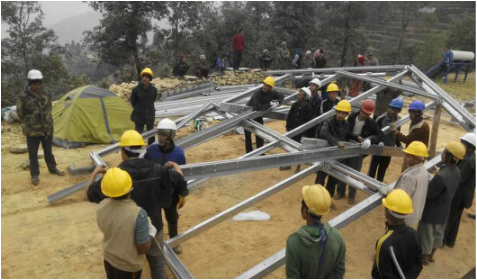 Envisioned as a participatory project that uses the exchange of social capital as the primary cost saver, this initiative could be a prototype for Nepal's rural redevelopment. ﻿We target to rebuild schools and houses in our project area to demonstrate the feasibility of large-scale local and volunteer driven reconstruction programme; to run a trial model which could be adopted by other local communities or future projects, and to fill the inadequacies in the existing emergency relief programmes directed by the government & large-scale NGOs. A good design does not just serve for its physical functions,such as construction of a basic rain shelter house and a community center. What’s more is that it brings HOPE. We hope that the participatory design reconstruction project can enable villagers to recognize their own abilities, restore their confidence,rebuild their lives, reconnect with their communities and regain hope after the disaster. Both men and women villagers can participate in the decision-making throughout the rebuild project. 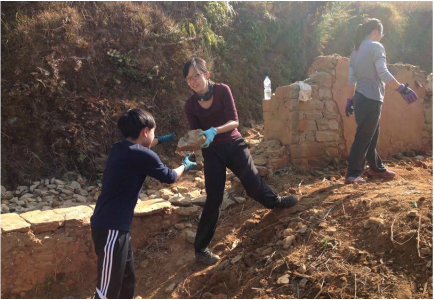 The new seismic resistance design allows not only male villagers but also female villagers to reassemble the house structure themselves, bringing alternatives to the traditional roles of the two genders. It also enables men to understand more about women’s contribution to the family and community, establishing a more sustainable and equal relationship.